Asiago scalloped potatoes is an easy, cheesy side dish recipe you can be proud to serve your family for a holiday dinner or brunch. This homemade classic starts off on the stove top and is finished in the oven thanks to an old fashioned cast iron skillet. 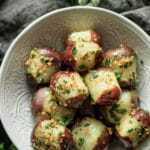 Made with heavy cream, onions and garlic this recipe tastes wonderful with ham. It's simple, traditional and is best served hot for a truly unforgettable side dish. This post was originally published on November 16, 2017. 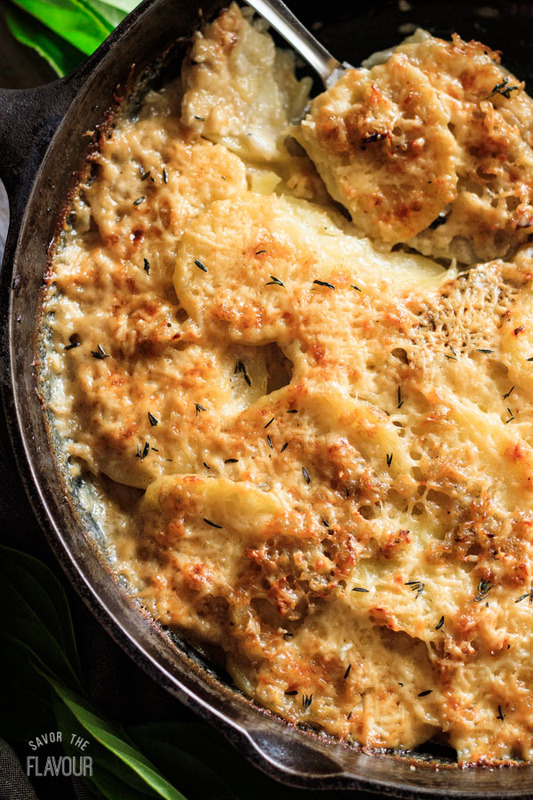 Asiago scalloped potatoes are a potato and cheese lover’s dream come true. 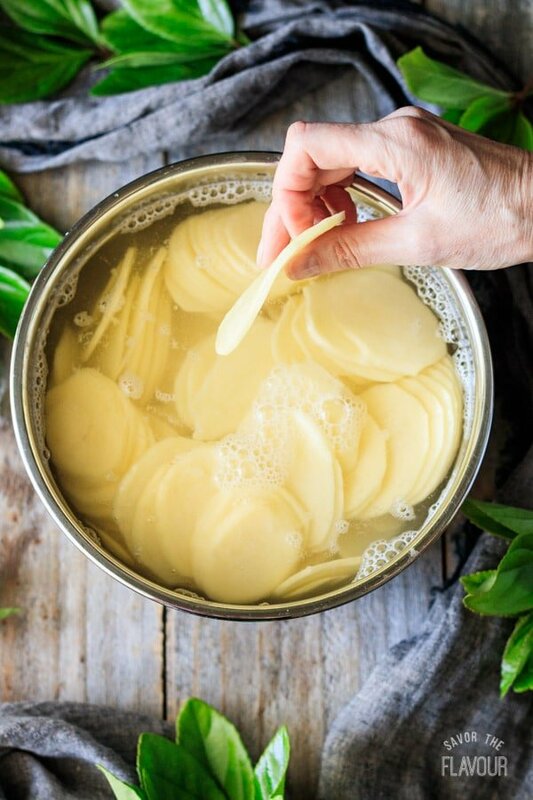 What’s the secret to a fail-proof scalloped potato recipe? Thin potatoes and a unique cooking method using both the stove top and the oven. Since this side dish is more a labor of love, we like to keep it for special holidays like Easter, Thanksgiving and Christmas. The hardest part is waiting for the scalloped potatoes to cook! Russet: since they are the starchiest potatoes, the cream will naturally thicken during cooking. Yukon Gold: they have a buttery flavor and a creamy texture. They also hold their shape the best. Yellow: since Yukon golds are a type of yellow potato, either one can be used and have similar results. These two dishes are very similar, and in many American households, the words are used interchangeably. Since there are so many different variations of both recipes, it’s easy to get them confused. 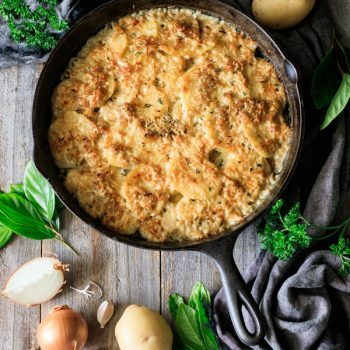 Scalloped potatoes: thinly sliced potatoes, always cooked in a creamy sauce with infused garlic and herbs, traditionally made without cheese. Potatoes au Gratin: very thinly sliced potatoes, can be cooked in a creamy sauce, always made with cheese, can have a crunchy bread topping. 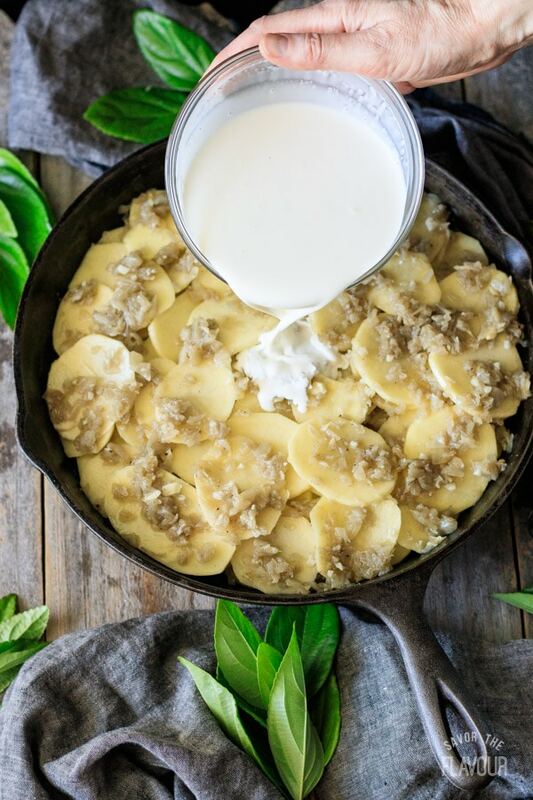 Can you make scalloped potatoes in advance? You most certainly can! Make, bake, and let it cool to room temperature, then cover tightly. This can be refrigerated for up to three days before you reheat it. When you are ready to serve, reheat in a 350 F oven for 30 minutes or until it is warmed all the way through. 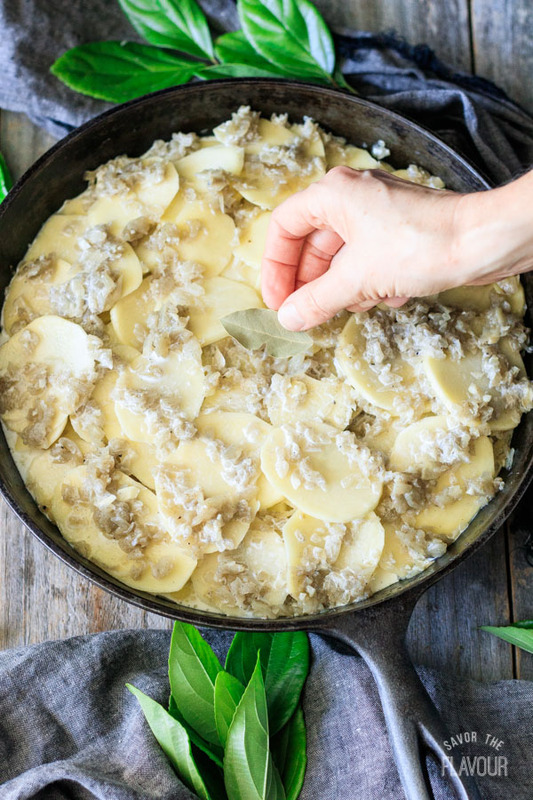 Can you freeze scalloped potatoes? Unfortunately, homemade scalloped potatoes don’t freeze well. The cooked sliced potatoes and the cream sauce aren’t the same after freezing, thawing, and reheating. If you have any leftovers, cover them so no air can get at it and refrigerate for up to 5 days. 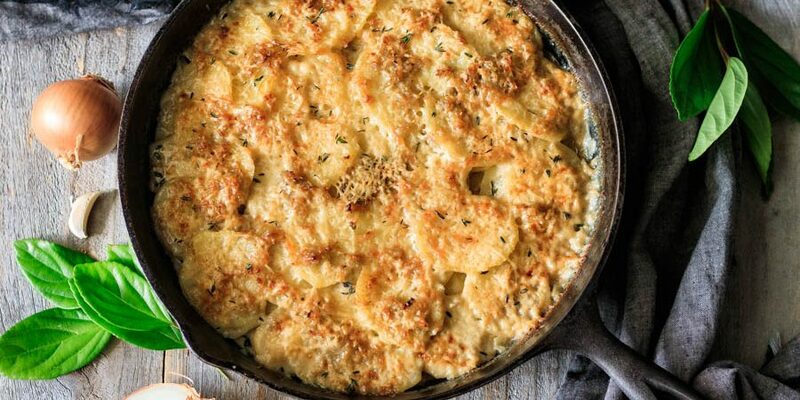 What do you serve with scalloped potatoes? Since this side dish is rich and creamy and so comforting, it really can be served with almost any main dish. It can be seen on holiday tables along side other popular holiday meats like glazed ham, crown roast, and leg of lamb. Gather the ingredients. Chop the onion, mince the garlic, and grate the two cheeses. In a large cast iron skillet, melt the butter over medium high heat. Saute the onion until soft, then add the garlic and cook until fragrant. Add the spices and cook for a minute to make the spices bloom. Transfer the onion mixture to a large bowl. 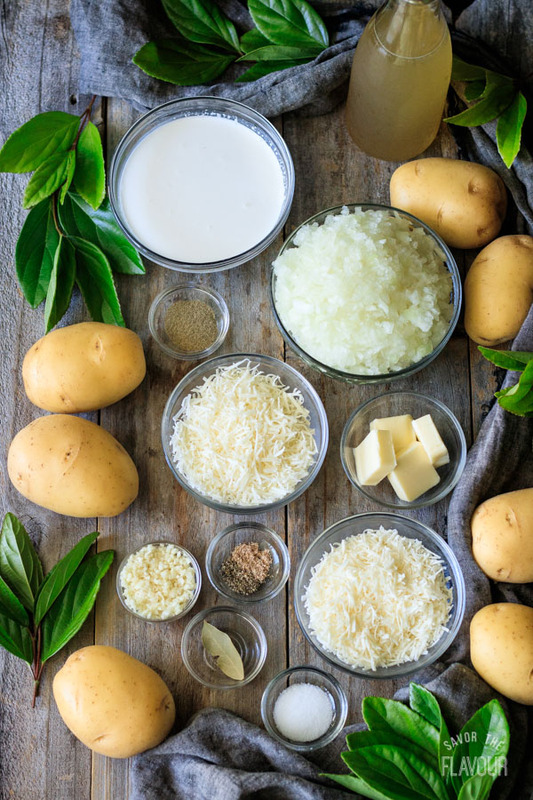 Using a food processor, mandolin, or box grater, slice the washed and peeled potatoes a consistent thickness, roughly 1/8 inch. 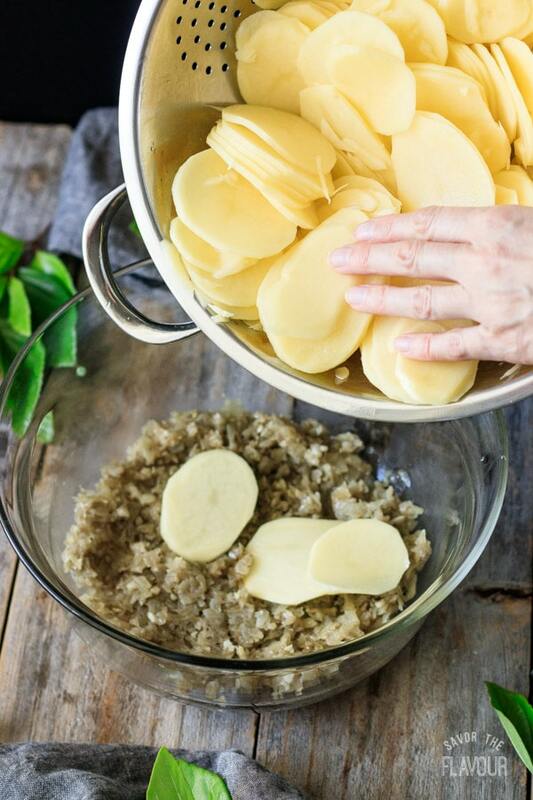 Submerge the sliced potatoes in a bowl of cold water to prevent the potatoes from changing color. Drain the potatoes in a colander, making sure all the water is gone. This will also remove the surface starch from the potato. Add the sliced potatoes to the onion mixture. Mix gently with your hands so each slice has some onion mixture on it. In the same cast iron skillet, melt the butter and remove from the heat. Carefully place the sliced potatoes in the skillet. Pour the heavy cream and the chicken stock all over the sliced potatoes. Preheat the oven to 425 F. Add one bay leaf in the center of the skillet. Cover with a large lid, foil, or a small baking sheet. Bring to a boil then simmer for 10 minutes. Remove the lid, and sprinkle on the two cheeses, Asiago and Romano. Put the cast iron skillet in the oven for 20 to 23 minutes or until the top is golden brown. 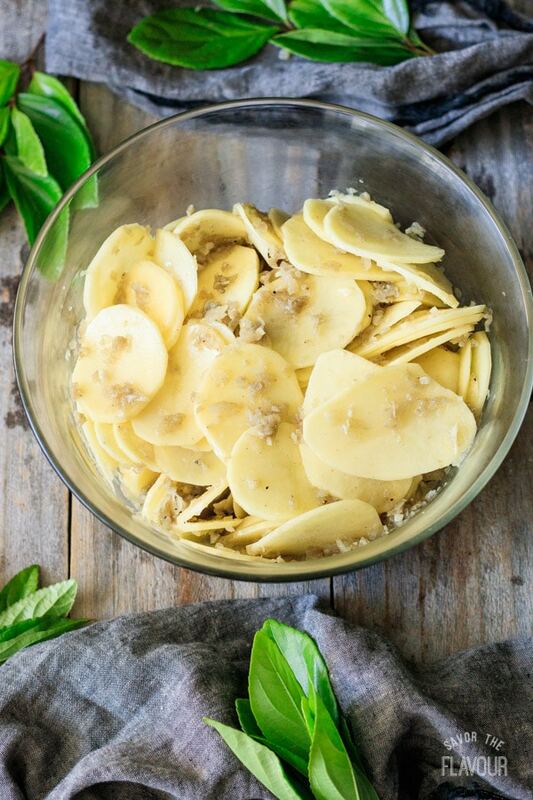 Garnish with some fresh thyme leaves and let the scalloped potatoes sit for 10 minutes on a wire rack. 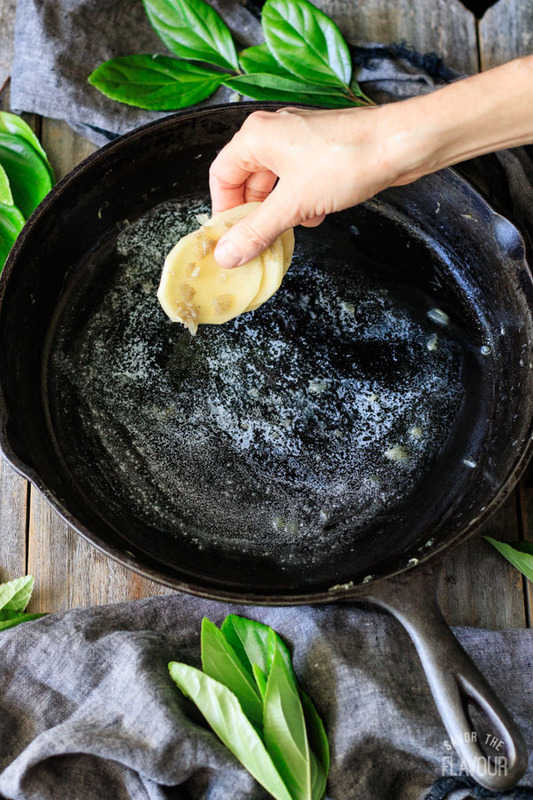 Once cooled, carefully remove the bay leaf from the center. 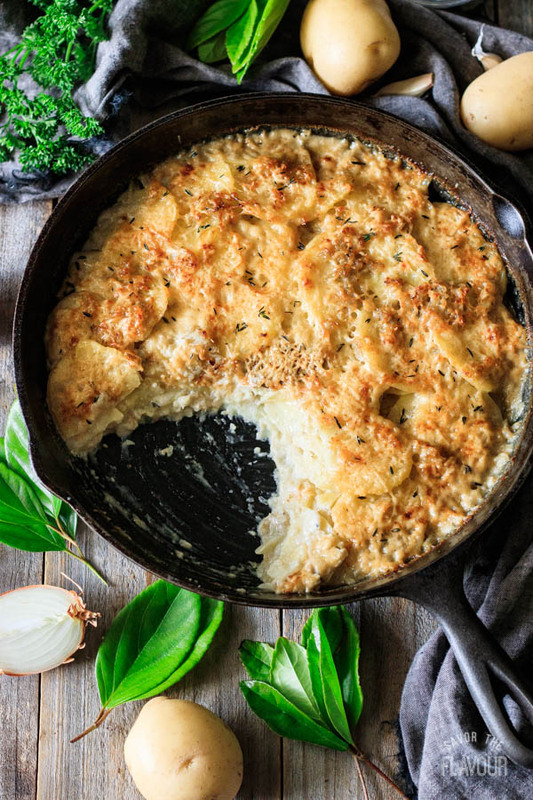 Since cast iron retains heat really well, the asiago scalloped potatoes should stay warm for an hour. Use a starchy potato. It will help the cream thicken up. 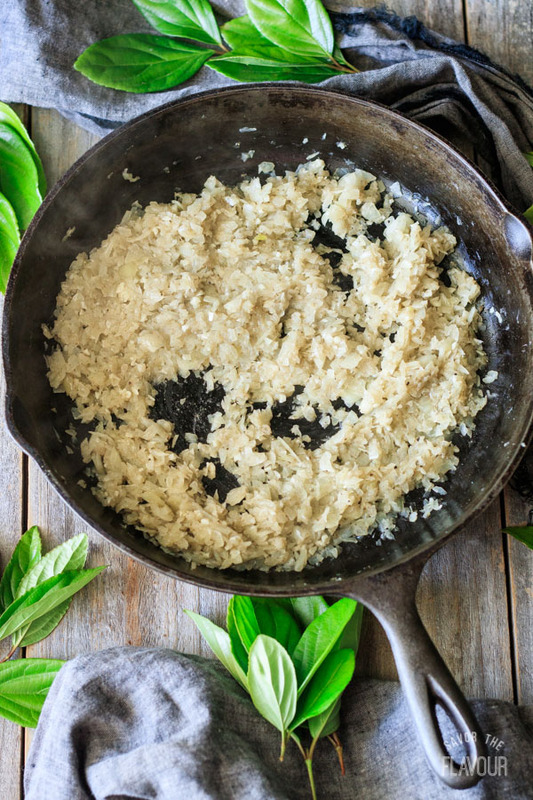 Use a cast iron skillet. It’s guaranteed to cook the potatoes all the way through. Use two cheeses. It makes the flavor profile more complex. Want a different cheese? 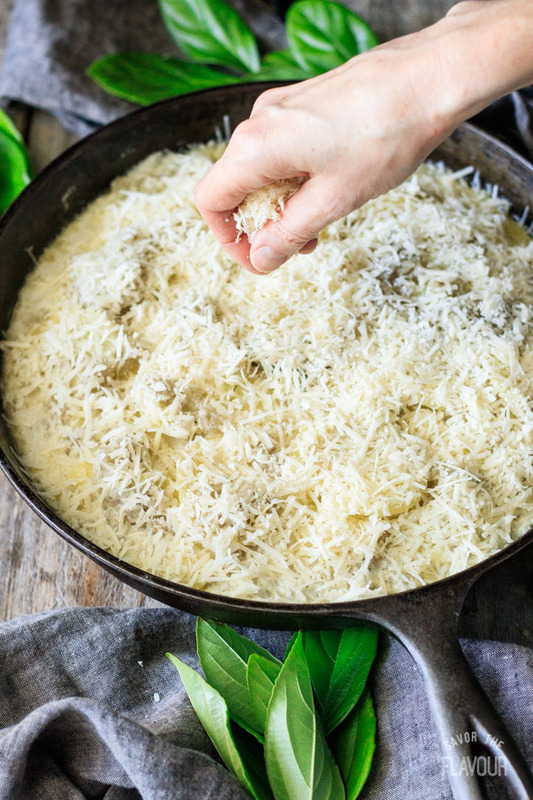 Try a good melting cheese, like gouda, fontina, or gruyere. Don’t want any cheese? 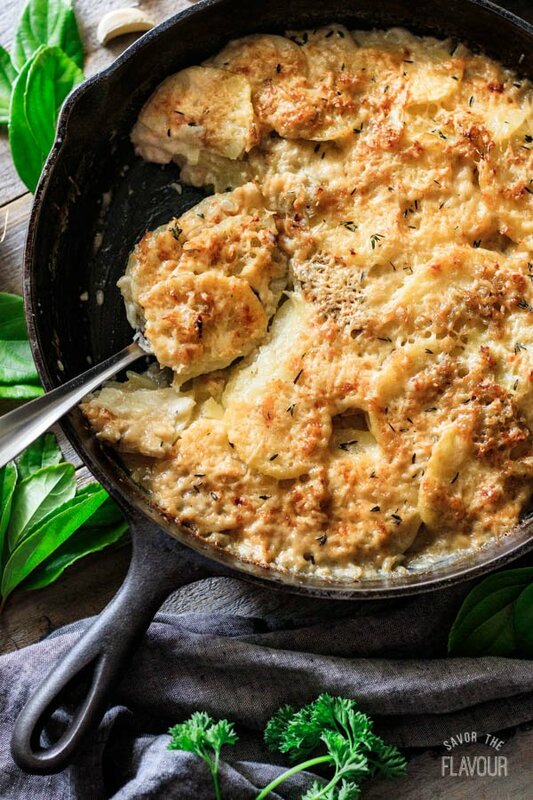 Traditional scalloped potatoes are made with cream and no cheese, so you’ll be fine. Don’t want to use heavy cream? Make a roux with butter and flour, then add whole milk and chicken stock. Want to prep the potatoes ahead of time? 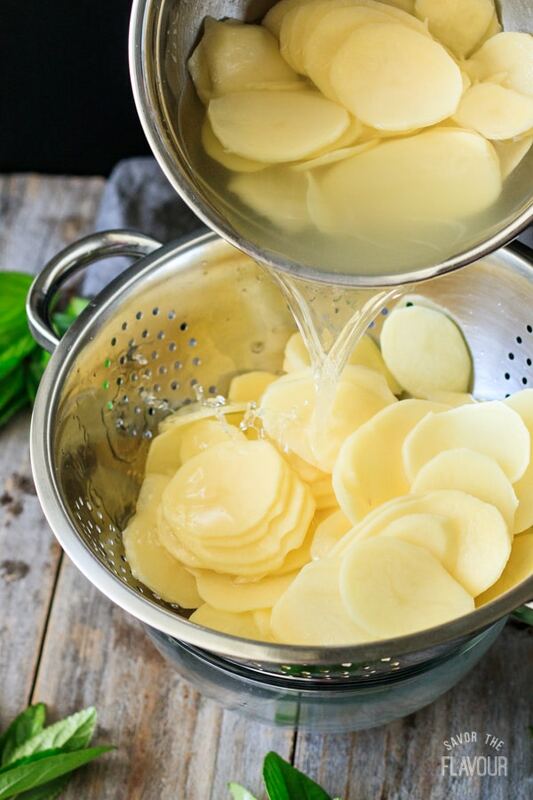 Soak sliced potatoes in cold water with a little vinegar or lemon juice to help them from turning brown. Place them in the fridge for 12 to 24 hours. Drain well. With this holiday worthy recipe, you’ll have a side dish that you can be proud to serve to your family and friends for any special event. 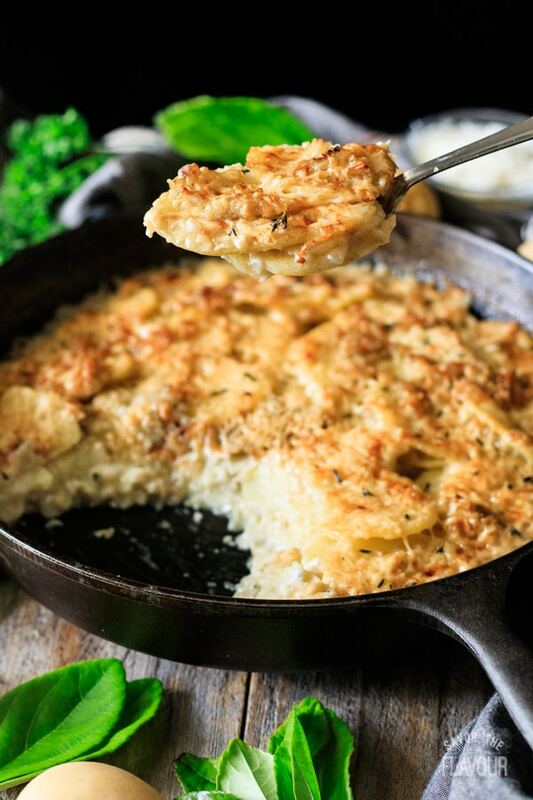 Plus, your house will smell so delicious, you won’t want to wait long to eat these cheesy asiago scalloped potatoes. 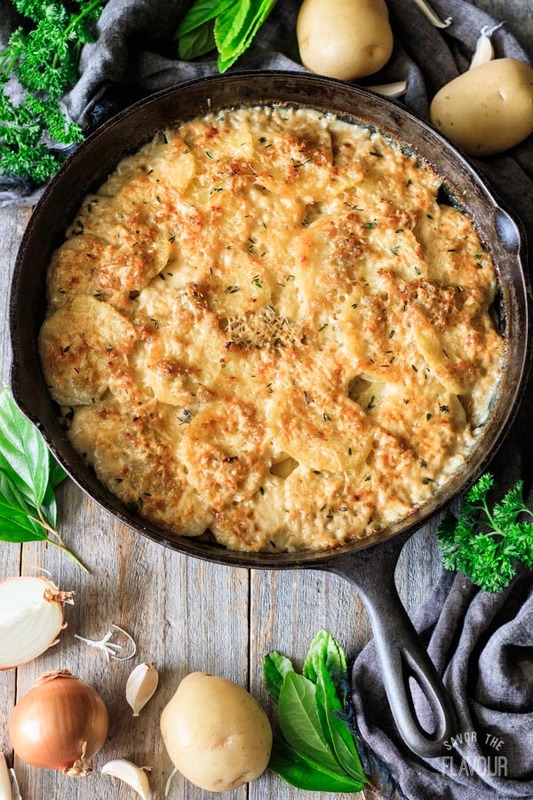 Love this asiago scalloped potato recipe? You’ll want to check out these other holiday worthy potato sides. 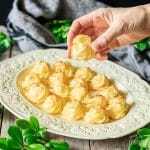 Duchess Potatoes: an elegant potato appetizer that’s piped in pretty rosettes. 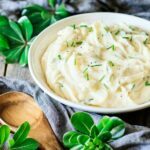 Sour Cream Mashed Potatoes: creamy, tangy, and buttery–it’s all the goodness of homemade mashed potatoes. Garlic Parsley Potatoes: red potatoes tossed in butter and browned garlic. So good! The pleasure of a five star review for this asiago scalloped potato recipe would be greatly appreciated.